Electro-pop duo release their new album. Louder Than War’s Paul Scott-Bates reviews. Like Indie music before it, the term ‘pop’ was coined to mean something quite different. Literally a shortened term or ‘popular’, it soon became a genre under which to file everything that was upbeat and catchy. What followed was ‘alternative pop’, a way to describe buoyant songs that wouldn’t necessarily be pumped out of your radio or reach the heady heights of any chart. What Battery Operated Orchestra have achieved with Snare is a part of both, let’s call it ‘clever pop’. Clever pop because many of the songs on Snare aren’t instantly addictive, instead they insist on depositing a fragment of intrigue that will soon, very soon, tunnel its way into your head creating earworms that will stay for quite some time. Take album opener, Strange Goodbye for instance, it somehow avoids the obvious temptation to launch into a frenetic percussive break, particularly around the three minute mark but resists taking you to the edge of your seat. The vocals of Brigitte Rose are fascinating and enticing and when joined by husband Chris Black, the duo create some enthralling analogue crunching beats. Sweet Dreams is radio fodder if ever a thing existed. The last track to be written for the album it could well be the one that breaks them into the true world of ‘pop’. It has the feel and hook to feature on daytime radio in truly excessive amounts given one or two lucky breaks. With a hint of Depeche Mode circa Violator era, it pounds with an upbeat ebb and thrusting bass tones, it is the first sign on Snare that this is an album not to be underestimated. 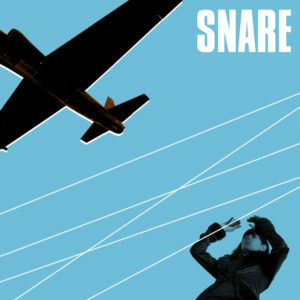 Inspired by cold war, Snare uses 70s and 80s synth sounds to marry the errors of our past with the uncertainty of our future: “Snare exposes the dangers of nostalgia and comfort, the lies we tell ourselves in order to continue doing the wrong thing”, say the pair. It is that kind of forethought and twist perhaps that makes Snare so compelling, never knowing which direction of turn the tracks will take next. Battery Operated Orchestra cavort with punk and disco in a way that makes it sound like the obvious combination – the unpredictability of a harsh industrial throb married with a catchy dance beat makes BOO stand out from the crowd. Recent single Perfect Wreck seems sugar coated on the surface but break the saccharin to hear Rose sing “one time I tried to break your neck” and you realise that there is more to them than meets the ear. Nocturn provides a repetitive hook that epitomises catchy music and recent single Bella is uplifting and full of the joys of a stunning summer with synth breaks that bring a smile to the face. The simple beauty of A Clearing shows another side to the duo and closing instrumental Borders (Fall) ends an album that is incredibly accomplished and jam packed with high quality. An album of the year? Quite possibly.